Welcome to today's 1963 Arrow Duplex Cabover. The step-up tiny camping home for the person who needs a bit more space (or has more kids, haha). This one here is a 1963, almost 55 years old! I'd love to look this good when I'm 55, just sayin'! 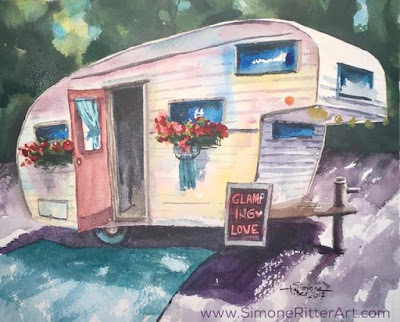 Here is what its proud owner shared with me: "This is my camper Flo. We have a lot of fun because I just 'go with the Flo.'" Some comments make my day, and this was one of those! Thank you very much for sending in your darling Flo for us all to smile with you! I am posting this, yawning. So tired today. 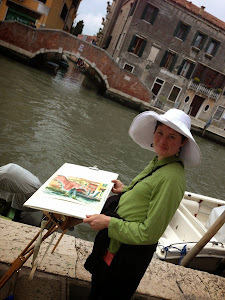 This weekend I was out and about painting at Kings Landing Historic Settlement at their annual plein air fundraiser. The other artists attending are fun to be around with and really, as creating art is kind of a solitary endeavor, it feels special to paint alongside likeminded. We stayed at the bunkhouse where they host the summer camp kids. You can guess how well I slept, haha! I will share some of the paintings created with you once the month and my camper project is over. If you are interested in looking at the exhibit and enjoy a wonderful fall excursion, you can head to Kings Landing until October 9th, 2017 before they close for the season.